Over 50 years ago, just before my father bought this property, the previous owner created this small pond in what was a field at that time. This is a spring fed pond about 60 feed long, 30 feet wide, and about 3 feet deep. Most likely it was made for horses or cattle and possibly for wildlife as he was an avid deer hunter. Over the years it started to become filled in and no longer much of a pond. About three years ago we had it re-dug for about $300.00. It has been fun to see it being used by wildlife. 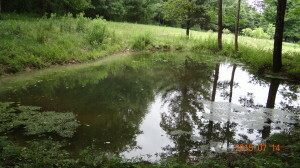 The pond is also near our apiary and it makes a close source of water for the honeybees. The muddy water in the photograph is where deer have recently come to drink. 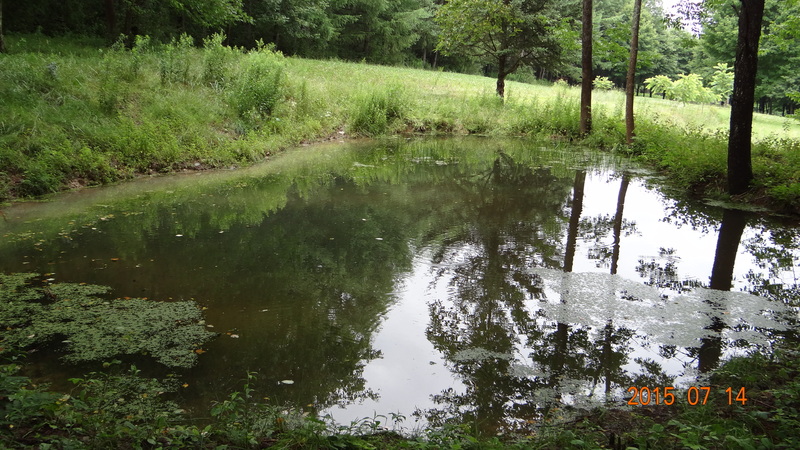 The pond is at the edge of a field where our deer food plots are located, which also makes this spot attractive to the deer. Deer require a water source and this is specially helpful to them in dry periods of the year. It is the only site for quite a distance that has a permanent pool of water that can be used by our local amphibians to lay their eggs in the spring. We have a variety of toads, frogs, and newts which utilize this location. The pond does require some maintenance. 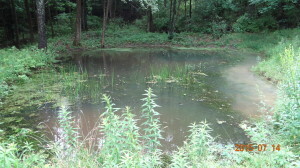 Since we have re-dug the pond, we have made an effort to control the vegetation that wants to grow up around the pond. 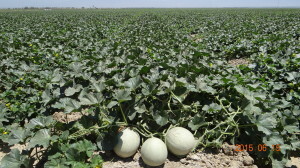 We do this with a combination of herbicide use, a bushhog (rotary cutter), and a string trimmer. We are certain that a lot of additional wildlife species use the pond, they are just more difficult to observe during a casual walk by. 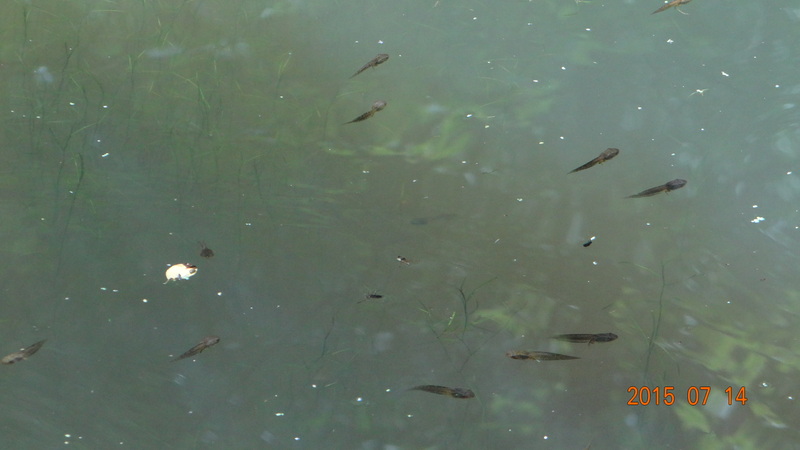 Frog Tadpoles Just Hanging Out! The winter in western NY in 2015 was characterized as extremely cold, with a lot of snow and many successive cold days which made it unusually difficult for honeybees to survive the winter. This was our forth year of trying to overwinter honeybee colonies. We had been getting Italian honeybee packages sourced from the state of Georgia. We were not able to keep any of these colonies overwinter. 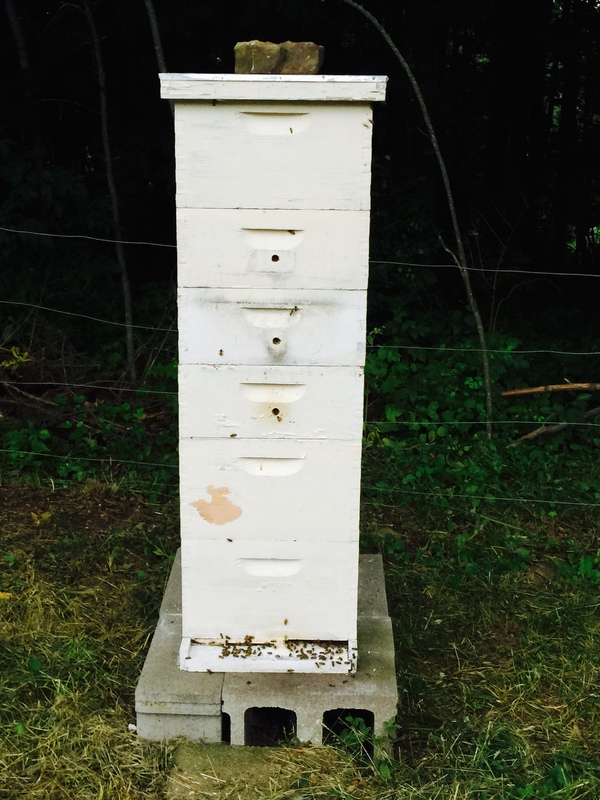 In 2014 we purchased two nucs of Carniolan honeybees from a local beekeeper in Rushford, NY. This beekeeper has 400 hives and has been successful overwintering his hives. One of these two Carniolan colonies survived and was quite vigorous by the first of July 2015. When opening the hive, both deep hive bodies were full of brood and the one super was almost completely filled with honey. 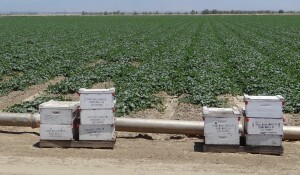 There appeared to be little room for additional bees. 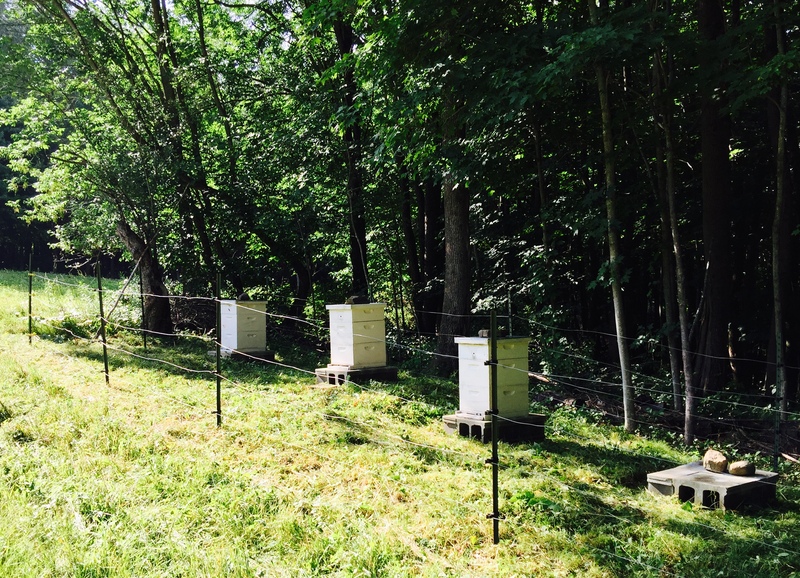 We are only able to visit this location occasionally, which forces us to be absentee beekeepers and this leads to making decisions and waiting to see the results some months later. We needed to make two basic decisions 1) How are we going to manage our mite population? 2)How are we going to manage space within the hive? The assumptions are that we have a healthy queen and that we have a mite infestation at some level. 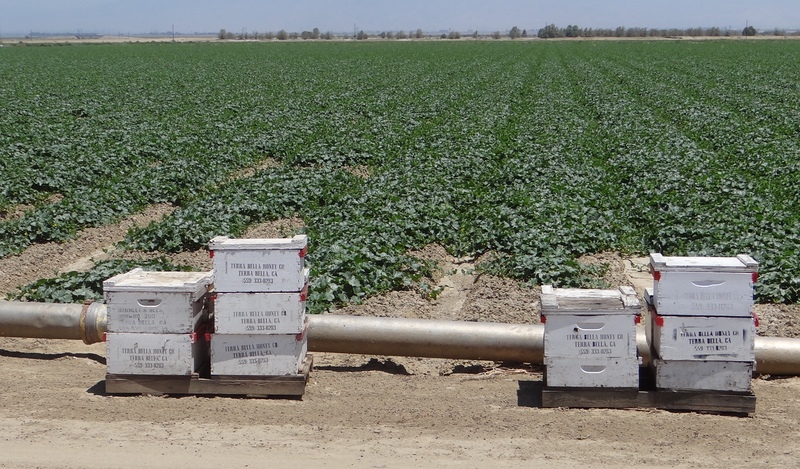 Controlling mites and managing space will impact both honey production and overwintering potential for the winter of 2015/2016. We treated this hive with 2 Apiguard trays above the brood chambers to suppress the varroa mites. We additionally added two medium depth Illinois supers plus one hive body on top. The purpose of adding the hive body on top was done for two reasons 1) As we disassembled the two hives that did not make it through the winter, we had hive body frames that still had some honey in the frames which needed to be cleaned before storing this equipment. 2) We wanted to add additional top space to possibly prevent swarming and/or provide additional storage space for surplus honey. This hive is surrounded by the constant presence of nectar producing white clover flowers. We have established approximately 2 acres of Whitetail Institute Whitetail clover. You may notice the 3 additional “ventilation” holes in the Illinois supers. We added these holes to provide winter hive ventilation, and to provide an additional hive entrance in deep snow. We made the decision to leave these holes when we added the Illinois supers. We will check this hive in early October to see how the bees adapted to the structure that we have left them. Hopefully the bees will be ready for winter and have left a little honey to share. 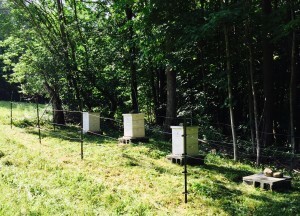 Note: The electric fence surrounding the apiary is a “Bear Fence” to keep out the local population of Black Bears. Within days of attending to our apiary, a local beekeeper was a victim of a local bear and her cub.